This shelving unit is 2 Ikea ‘Billy’ Book cases fixed together (my genius hubby’s idea). From the bottom working up, this houses my punches, more pens & fimo molds (in the coloured boxes), The triple drwaer units hold brads, charms, loose gem stones 7 embellsihments, The third shelf up holds more embellishments, paper flowers and adhesive gems. The fourth shel up holds tags, buttons, stickers, rub ons, glue pens, sharpies and peel offs (in silver case. The top shelf holds mostly scrapbooking supplies, a small sewing machine for sewing on card and a couple of large punches. On the very top is some newly accquired 12″ x 24″ and A3 pearlescent Anna Marie Card (stored out of harm’s way as it’s too yummy to let it get bashed). And lastly some empty boxes. 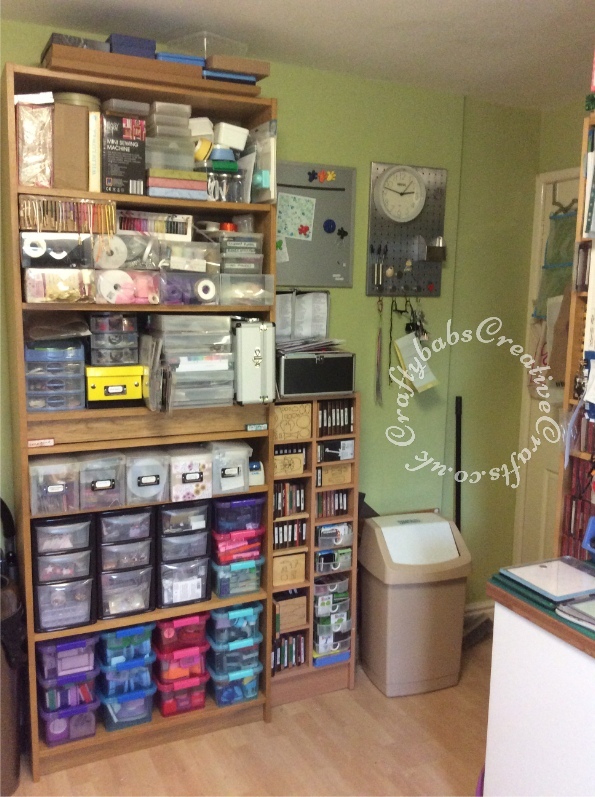 To the right of the bookshelves is a CD rack housing mostly custom made wood dies and some Sizzix sizzlits dies. The CD case on top of this holds my Quickutz revolution 4″ x 4″ die collection.